There is an interesting controversy out of New York where Rutgers University lecturer Kevin Allred who was arrested and sent to a hospital for a psychiatric evaluation for what he and his supporters say were political speech about the Second Amendment. In a tweet, Allred wrote “Will the 2nd amendment be as cool when i buy a gun and start shooting at random white people or no…?” The answer appears to be no. He also said that his social media account was suspended pending the deletion of the tweet. In the end, the response by the university could be criticized as an over reaction but the school may view this as just taking responsible action after violence at Virginia Tech and other schools. The tweet however was tied closely to the Second Amendment and seemed to me to be rhetorical. The question is whether the university could have resolved this problem by speaking with Allred or whether tried to do so without success. If the point was rhetorical, why didn’t this professor use grammar that would make that clear? If he had written: “Would the 2nd amendment be as cool if I were to buy a gun and starting shooting at random white people or no. . .?” the rhetorical intent would have been plain enough, even if the question would still justly raise a lot of eyebrows. Is the good professor too grammatically impoverished to have thought of writing it that way? The comments in this thread seem to skirt or avoid the fact that if nothing had been done, and the man started shooting anybody on campus, there would be a whole different cry for heads to roll. The emphasis now is for people to be alert to signs and statements and behaviors as there have often been indicators that others should have caught. Let’s not forget those who were killers, but circumstantial evidence wasn’t considered nor preventative measures taken. It’s essentially a damned if you do, damned………. .
We don’t want a police state, and we don’t want to die either. How often do we hear that “even if we save just one life, the (effort, action, procedure) is worth it.” Of course that mantra is a very sharp two edged sword. a Welfare Check is where the cop come by and see how you’re doing at the request of a loved one or concerned citizen? He must have said something to the cops to make them think he was a danger. We didn’t need a warrant, it was a Welfare Check. Interesting in an era where Emergency Mental Health issues are often denied because of lack of facilities or staffing Mr. Allred seems to have found an instance where the system was operating at top notch, no waiting here. I have to laugh at folks who object to immigrants keeping their traditions and language. The fact is that most immigrants did not learn English, and in Texas, the German immigrants only spoke German in their daily life. LBJ went to the local grade school which was taught in German, not English. The same was true of many other immigrant groups. In Texas, it was only in 1917 that the state made instruction is English mandatory for all public schools. The Republic of Texas was officially bilingual and mandated the use of Spanish in all laws and legal documents. In urban areas, most languages had their own daily newspapers and most of the recent immigrants spoke little if any English after having been here for years. Teddy Roosevelt sought office by speaking German and French as common languages in which he would address the voters. He was very fluent in both and was not accused of pandering to immigrants, and had no problem using his fluency to great advantage. That’s not relevant to today’s world. And President Teddy Roosevelt also said “There is no room in this country for hyphenated Americanism. When I refer to hyphenated Americans, I do not refer to naturalized Americans. Some of the very best Americans I have ever known were naturalized Americans, Americans born abroad. But a hyphenated American is not an American at all … The one absolutely certain way of bringing this nation to ruin, of preventing all possibility of its continuing to be a nation at all, would be to permit it to become a tangle of squabbling nationalities, an intricate knot of German-Americans, Irish-Americans, English-Americans, French-Americans, Scandinavian-Americans or Italian-Americans, each preserving its separate nationality, each at heart feeling more sympathy with Europeans of that nationality, than with the other citizens of the American Republic … There is no such thing as a hyphenated American who is a good American. The only man who is a good American is the man who is an American and nothing else.” And I suspect he would feel the same about Mexican-Americans, African-Americans, and Arab-Americans today. OMG! BREAKING!!! The rest of the story is that they found this in the guy’s fridge! No wonder they locked him up in the nut house! This is the icing on the cake that he was crazy! But, that’s only a squirt gun. It won’t make anyone eat lead . 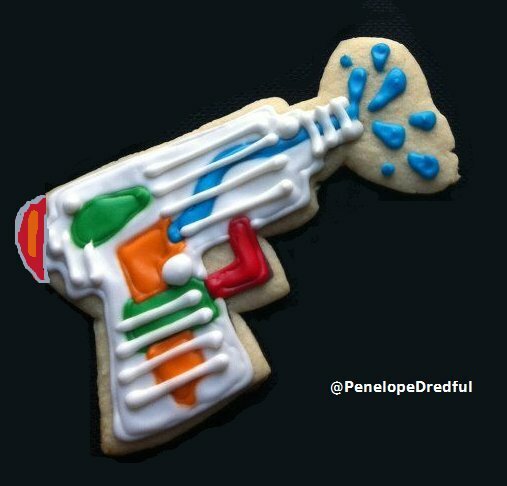 . . just cookie frosting. 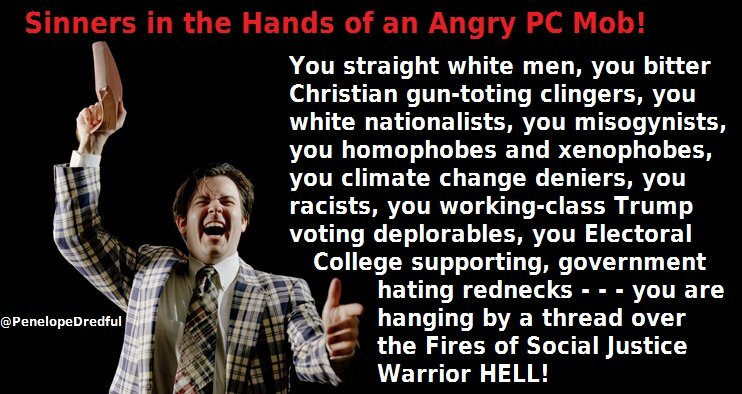 Doesn’t the PC crowd remind you of those hellfire and brimstone preachers??? I have a difficult time accepting this as anything other than political speech. Unless there was more evidence, a post such as this is not evidence of violently pre-disposed mental illness. The authorities who ordered the mental health civil commitment could have used better discretion. I have to disagree with our host on the relevancy to this matter to previous shooting outrages on college campuses. That would be indicative of fear dictating reasonable suspicion and objectivity. He also tweeted he was going to run over Trump supporters. Regardless of whether his speech is protected, do you think he should be teaching students, some of whom may be Trump supporters? Fwiw, I didn’t vote for Trump, and I see the combination of the actual working of his two tweets (and the others he was tweeting) as sufficiently problematical to justify some formal police interaction. While you can read the gun tweet as political, combined with running over Trump supporters, I think it’s entirely reasonably to read it as credible enough to justify a police call. There is speech that is obviously political speech, and then there is wtf speech that justifies an inquiry. I can’t blame Rutgers or the cops for reacting to this guy’s speech with wtf. I had a comment get swallowed up by the spam filter I guess? See Popehat on the 16th, who finds the tweets “probably” protected speech but … Well, go read Popehat. I seem to remember some similar threats alluded by the Donald during is campaign re guns, tossing out people, ‘getting tough’…..
We have some dire news to share. This morning, President-Elect Trump announced his pick for Attorney General and it couldn’t be much worse for the marijuana law reform movement and our recent legalization victories. Trump’s pick, Alabama Senator Jeff Sessions, is a militant prohibitionist. We could go into great detail how Senator Sessions has been an outspoken opponent against reform, but in this case his rhetoric is so off the wall…we’ll let his past statements speak for themselves. The stoner lobby doesn’t care for him. You say that like it’s a bad thing. Obviously this was an over reaction by the university. Right wingers are constantly making actual threats that are not rhetorical about killing people generally, black people and specifically the President but they don’t get a psych eval. It’s preposterous. And right wingers are the people who are far more likely to carry out such threats as witnessed in the Oklahoma City bombing and in the mass shooting in Charleston not to mention the out of control idiot Bundy brothers and the loons that support them.